In ancient and modern times and tradition, the marking of the tenth year is a celebratory affair and the first significant one in the order of anniversaries. This year, 2010, the year of the TIGER in China, marks the 10th anniversary of Just 4 Fun. Like the unique stripes of the tiger, Just 4 Fun has started mas in Saint Lucia’s carnival that has been both unique as well as innovative and awe inspiring. As we celebrate our tenth anniversary, we reflect on the number 10. Both the Greeks and Hebrews held 10 to be the perfect number. Pythagoras considered that 10 comprehends all arithmetic and harmonic proportions, and, like God, is tireless. All nations calculated with it because when they arrive at 10, they return to 1, the number of creation. Ten is said to be a number of completion, a number of mystical love as confessed by the Greeks. And so with this in mind, this year “Just 4 fun” celebrates our tenth year in carnival taking it back to a new beginning, taking it back to the source, a place where fun begins a place of love. 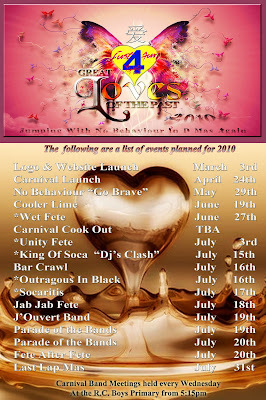 ... And in 2010, Just 4 Fun will portray, "Great Love Stories"
carnival launching is when? they didn't even think of may, they just jumped a month ahead. will it conflict with jazz? anyways, anxious to see how helen will be portrayed.